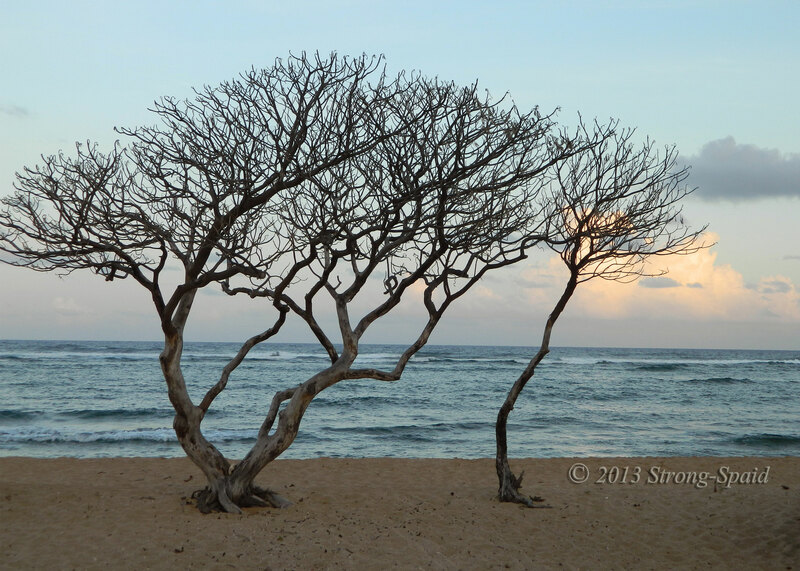 This entry was posted in Nature, Photo Essay, photography, Poetry and tagged Kauai, stories, sunset, trees, Water. Bookmark the permalink. One of the best things to do, especially in the winter cold, is to hug a tree. Trees are always happy to share their warmth. Trees and an ocean sunset….a beautiful way to end a day. Wish I lived there all of the time (island of Kauai). What a truly unique blog you have! And fantastic photos! Oh grand and tender words and so sad the fallen tree…. You are a wonderful poet. Not to worry! 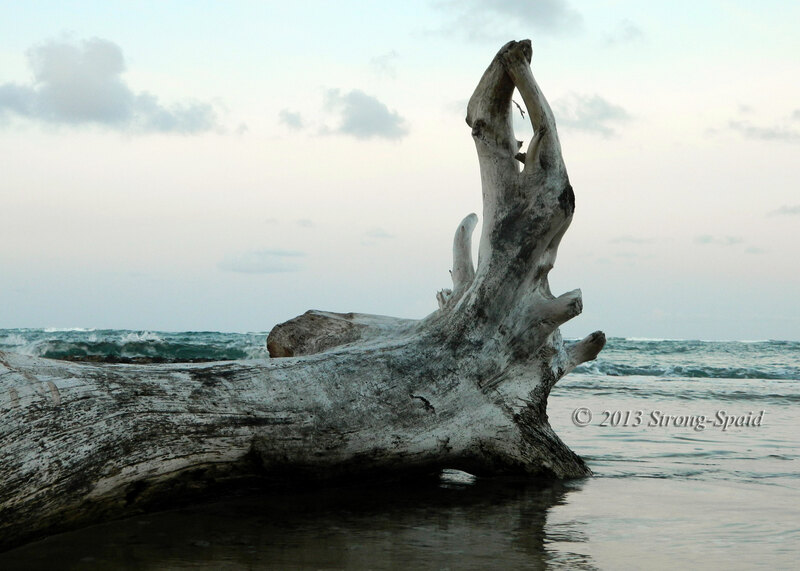 The fallen tree is not really dead….it’s just doing yoga (the driftwood pose) on the beach! Excellent, both photos and thoughts! Thank you once again, Montucky! Always glad to see you stopping by….. I see, on your website, that you have all of your pencils organized and ready to go….beautiful pictures await! Thank you for the compliment! 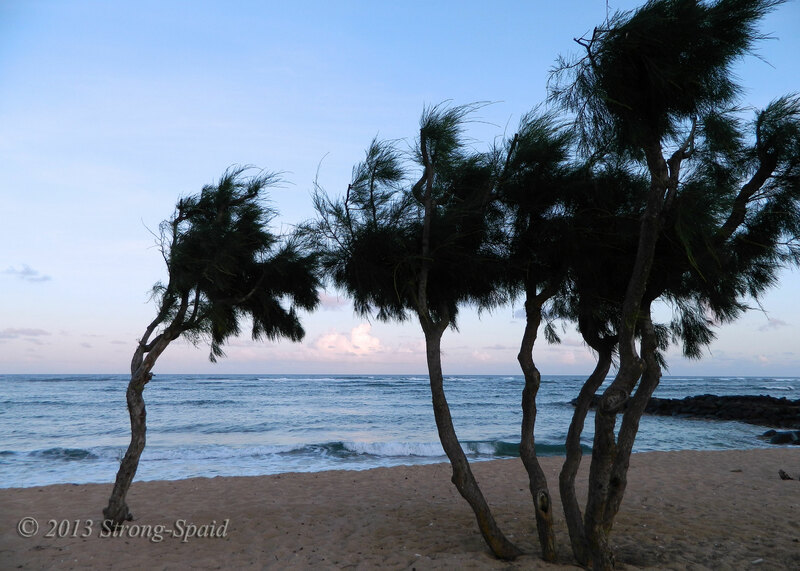 When I was walking down the beach, I saw these trees leaning over—gossiping about something.. I believe every single tree has a story behind; it tells its story through the shape of its branches, the colors of its leaves and the way it grows up to give us a remarkable shoot. You can never find two identical trees. Trees are inspiring somehow; they could grow without water and endure thirst from year to year, till the rain comes over to give hope and joy to the abandoned trees. I have always felt that way too. Trees stand there for years and years watching as life passes by all around them. Having seen so much, their wisdom runs deep! Those trees are definitely windswept, but hanging in there. Thanks for sharing your photos and words with me Mary!